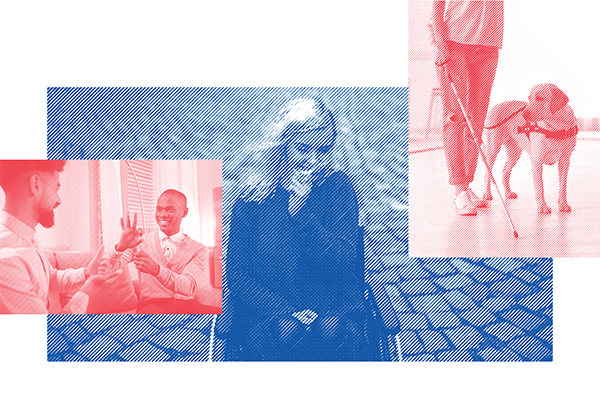 People with disabilities face widespread discrimination, segregation, and exclusion. But federal disability rights laws can provide protection. If I have a disability, what are my rights at work? Your boss, coworkers, or customers direct derogatory comments, jokes, or gestures toward you that are related to your disability. An employer refuses to hire you, promote you, or pay you equally to your coworkers because of your disability, when you are capable of doing the job. Your employer refuses to make “reasonable accommodations” – changes to how a job is done so that you can have an equal chance to succeed. An employer demands that you disclose or talk about your disability when you have not asked for an accommodation. Federal law protects people with disabilities from discrimination in employment. You do not have to inform an employer of your disability when you apply for a job or when you are hired — even if later you need a reasonable accommodation. If you can do the job, it is unlawful for an employer to refuse to hire or promote you, to fire or demote you, to harass you, or to pay you less because of your disability. You are also protected from unnecessary medical inquiries at work. You have the right to ask for and receive “reasonable accommodations” that allow you to have an equal chance to succeed. However, private employers with fewer than 15 employees are not covered by federal disability nondiscrimination laws. Let your employer know that you have a disability and request a reasonable accommodation. You may need to provide a doctor’s note if your employer asks for one. If your employer says no to your requested modification, try to keep the conversation going. Try to think of another change that would help, or ask your employer to look at the Job Accommodation Network website. File a charge of discrimination with the U.S. Equal Employment Opportunity Commission or your state fair employment practices agency. Depending on your state, your deadline to file with the EEOC or your state agency may be as short as 180 days. If you are a federal employee, contact your EEO counselor within 45 days. A landlord refuses to rent to you because of your disability. A landlord asks for a deposit that is higher than that asked of tenants who do not have disabilities. A landlord prevents you from making modifications to your apartment or home to make it more accessible. A landlord refuses to make reasonable accommodations to the rules — for example, the landlord prohibits a service animal based on a blanket “no pets” policy. You have the right to be treated like any other prospective tenant when applying to rent a home. Discrimination on the basis of disability is illegal under federal law. You are allowed to make physical changes to your rental unit to make it more accessible to you. Private landlords are not required to make these access changes for you. Landlords may have the right to ask you to restore the unit to how it was or put money in an escrow account to ensure they can. You have a right to reasonable accommodations in in rules, policies, practices, or services. You may have additional rights in public housing, in housing that is federally funded, and in public spaces associated with your housing such as parking lots, garages, lobbies, and sidewalks. File a complaint with the U.S. Department of Housing and Urban Development or with a state or local fair housing agency. You must file a complaint with HUD within one year of the last date of alleged discrimination under the Fair Housing Act. In some cases, the right federal agency may be the U.S. Department of Justice. A business owner refuses to allow a person with a disability to bring a service animal inside. A person opening a business fails to ensure that any new construction is accessible to people with mobility or sensory disabilities. Under the Americans with Disabilities Act, it is illegal for businesses open to the public such as stores, hotels, restaurants, museums, theatres, and doctors’ offices to discriminate against people with disabilities. You have the right not to be excluded from these spaces. The ADA only requires that businesses make architectural changes to their buildings that are “readily achievable.” Nonetheless, because the ADA has been in effect for 28 years, most businesses and buildings should have made themselves fully accessible to people with disabilities. Newly constructed commercial buildings must be fully accessible. You have the right to bring your service animal into any business, even those that have an explicit “no pets” policy. File an ADA complaint form with the U.S. Department of Justice.